Historical research on the constitution of racial categorization as a political resource relies upon the paradigm of social constructivism. From this general agreement, different approaches clash when trying to decide at what point an act of discrimination can rightly be described as being racial. Several models are presented in the article. The main aim of the argument is to show, firstly, that the designation of otherness primarily concerns groups that are scarcely distinguishable in terms of visible differences, and, secondly, that racial policies are intended to slow down processes of reduction of otherness. 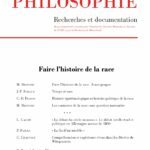 This article argues for the development of an epistemological history of the concepts of race and for its necessary connection with a political history. We distinguish between such an epistemological history and the history of racism or of the idea of race. By contrast with the latter, epistemological history doesn’t take for granted an a priori definition of race or a homogeneous referent that can be traced throughout history. It rather focuses on the variety of the effective and plural uses of the category of race in different contexts and identifies the rules that regulate these uses and the various strategies and practices that they form a part of. Such a history cannot be separated from a history of race as an object and subject of specific political practices: it has to be related to a political history of race, which we try to define. The article assesses that the definitional components of the concept of race must be identified contextually and politically. It opposes both the approach that looks into our ordinary intuitions for the minimal descriptive core of the concept and the genealogical approach that looks into the successive historical uses of the concept in order to establish its core “original” components. It pleads for an understanding of race in terms of W. B. Gallie’s “essentially contested concept” and shows that the concept of race is a normative concept: our disagreements about it cannot lead us to conclude that we should get rid of race; rather, they suggest that we must question the system of political practices and values that constitute the paradigm within which the concept is embedded. In the face of the revolutionary “degeneration” of the Directory (1795-1799), “The Beginning of the New Century” (Schiller, 1801) crystallized the German debate between the years 1790-1800 with regard to three interrelated sectors: Fichte’s politics from “Jacobinism” to the nationalism of the Addresses to the German Nation; following Fichte’s and Kant’s subjectivism, the genesis of the early romantic period (Novalis, F. Schlegel), its irony and its reactionary “turn”; and the development of Hegel’s thought as a critique of Fichte’s and Kant’s subjectivism and romantic irony, the central question becoming the state faced with the conflicts of civil society. This article describes Wittgenstein’s conception of models. He is indeed famous for his criticism of models in that reality must yield to them. However, should one give up the use of models in favor of descriptions, as promoted apparently by the Philosophical Investigations? A detailed analysis of his remarks shows that models may have a legitimacy in the field of science in the form of norms of expression, but also in philosophy as points of comparison clarifying our language games. In Dictations Wittgenstein is between his first and his second philosophy. Dictations begins with the crucial problem of understanding as being neither a mental process nor a private personal experience. These philosophical remarks prepare his mature view that understanding is “seeing-as” or “hearing-as,” which presupposes his subsequent philosophy of aspects.